Quirky, light-hearted and wonderfully choreographed are words that describe Wes Anderson’s style pretty effectively, and over his career he has managed to make his very distinctive mark on the Hollywood landscape, whether it’s with the brilliant, by turns charming and melancholic ‘Moonrise Kingdom’ or the droll and whimsical ‘The Life Aquatic With Steve Zissou’, his distinctive footprints are all over every inch of the frame. The same can be said about this film, as right from the start we are thrown in to a hotel of such preposterous proportions and striking colours that you’re left under no illusions that it’s Wes’ world. Intricately constructed for maximum whimsy and sprinkled with a kind helping of the surreal, Anderson is successful in maintaining his reputation for quick-witted and sparkily original humour while managing to underpin it all in a sense of melancholic nostalgia that gives the film its power. Anderson certainly called all the favours in as his cast is a smorgasbord of Hollywood talent, from Fiennes to Bill Murray to Jeff Goldblum and Owen Wilson, almost everyone who is anyone makes an appearance, be it a cameo or a supporting role, and they do a perfect job of adding their own little bits of brilliance to the beautifully oiled machine. In amongst all those star names is débutant Tony Revolori who holds his own very well in a starring role, complimenting Fiennes very well and generating an oddball chemistry with anyone he interacts with that is consistently amusing. A mention must also be given to Saoirse Ronan, who puts in a charming performance as Agatha, a baker who becomes intricately involved in the plot simply by circumstance and a budding romance with Revolori’s character. 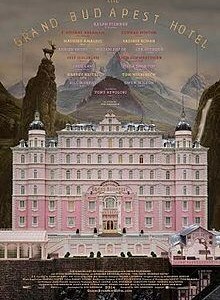 Anderson’s grasp of the delights of ornate visual wonders and well-written dialogue is as astute as ever, and it ensures that ‘The Grand Budapest Hotel’ sits nicely in his filmography as another example of his prowess. While it may not be his most thought-provoking or intelligent, it’s comic timing is impeccable and it’s definitely one of his funniest films, with wonderful performances across the board. Particular mention must be given to Fiennes, whose turn as the larger than life concierge M. Gustave showcases just how much talent he has as an actor and particularly unexpectedly for those who are used to seeing him in colder roles, as a comedic lead whose grasp of comic timing is impeccable. Fans of Anderson will definitely not be disappointed, while newcomers will discover a film that’s accessible and doesn’t smother you with style while ensuring that we know that Anderson’s stamp is firmly cemented upon it. A wonderfully droll, charmingly crazy caper.